The Indomitable Spirit and Grand Oak Live have teamed up to bring you an extraordinary evening. BUY YOUR TICKETS HERE! Raffles • giveaways • awesome speakers • a Thanksgiving feast • signature drinks • FABulous music • and Nellie Oleson herself… What more could you want? Come join me – and Nellie Oleson! 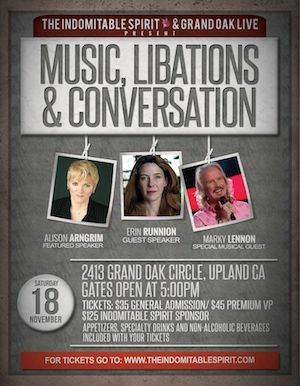 – and special guest, Erin Runnion at Nanci’s place, aka, Grand Oak Live on November 18th. Start the Thanksgiving week off right – with music, celebrities, and a full-on Thanksgiving dinner!! This is my FAVORITE concert venue and I can’t wait!! See you there, I hope!! A special THANK YOU to Grand Oak Live for sponsoring this event.